The training period at Featherston ranged from two to four months. There were permanent instructors to lead training although reinforcements had their own officers and NCOs. Most soldiers entered the army at Trentham Camp where they received basic training. More advanced training and field work took place at Featherston and other Wairarapa camps. Each numbered reinforcement trained as a group, broken down into companies (infantry) or squadrons (mounted rifles). Each hutment housed about 50 men, while tents usually housed eight to ten men. The eight large dining halls at Featherston could cater for the hutment population at one sitting. 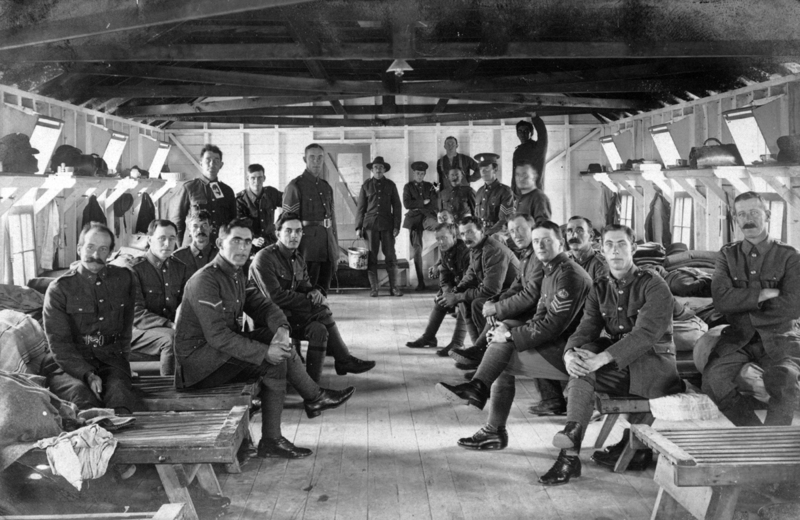 Training at Featherston was for most branches of the army except medical staff and pioneer (labour) companies. Infantry (foot soldiers) made up the largest part of the army. They practiced marching, arms drill, shooting, trench-digging, bayonet fighting, and attack and defence work. There was a riding school for mounted rifles and artillery, which needed trained horsemen. Mounted rifle troops had long treks, and the artillery did live firing near Morison’s Bush. The men marched or rode to training grounds each morning and afternoon. At night and in the weekends the soldiers had leave from camp. They could go to the soldiers’ club or canteen, religious institutes (which were run like clubs) or visit Wairarapa towns. There was no alcohol allowed in camp. Each reinforcement had a long leave towards the end of the training period. For the infantry, the final training was a route march from Featherston to Trentham, prior to embarking for the war. Shops at the camp allowed soldiers to buy extras – food, watches, badges and jewelry, books, specialised clothing – and provided services like boot repairs, laundry, photographers, picture theatre and shooting gallery. Dinner Roast beef, potatoes, suet pudding, tea.